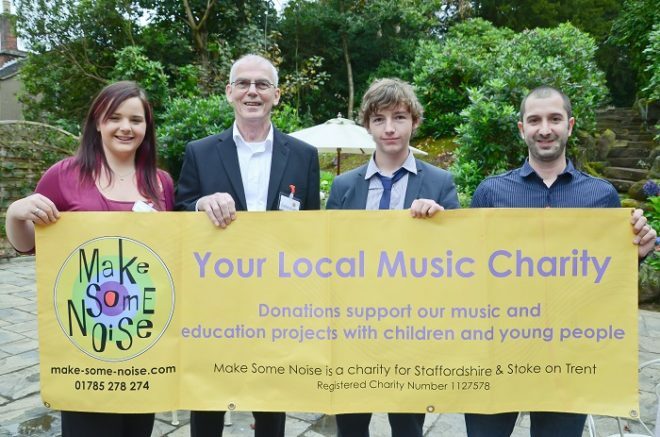 Make Some Noise Ambassadors 16 year old Reuben Wilson from Rocester and 21 year old Sam Walker from Burntwood lead the celebrations in a successful Legacy event held at The Upper House, Barlaston, near Stoke-on-Trent recently. The event which showcased some of the work delivered by Make Some Noise, brought together friends, representatives and supporters of the charity to celebrate the last ten years of dynamic music making for children and young people across Staffordshire and Stoke-on-Trent and to toast to the future. Reuben Wilson has been involved with Make Some Noise since 2009 and treated guests to a guitar solo performance of Stevie Wonder’s Superstition. Reuben, together with his sister Tilly aged 18 and Sam Walker aged 21, also ambassadors for the charity, helped to organise the event. Reuben said “I love playing my guitar but it’s so much better playing it with other people instead of playing on my own in my bedroom. Being part of Make Some Noise has given me the confidence to play in front of an audience without feeling nervous. I started by attending the sessions at Rocester Village Hall with my friend, who plays the drums. Later on I have played with the other music leaders at events to publicise Make Some Noise, for example, we played in Stafford town centre during the Arts Festival. I would recommend Make Some Noise to any other young person; it doesn’t matter if you can’t really play an instrument because the leaders are brilliant and will show you how to play simple things so you can be part of the group. It’s a great feeling to play music as part of a band. 21 year old Make Some Noise Ambassador Sam Walker from Burntwood, who recently took part in the London 2012 Olympic and Paralympic Games opening and closing ceremonies, shared her experiences of that and how being involved with Make Some Noise helped. Guests at the event were also encouraged to get up and dance following a lively dance instruction by Sam of a routine she performed at the Olympic ceremonies. Guests also enjoyed a unique live performance by an iPad band by pupils from MERIT (a medical Pupil Referral Unit) and a video clip from Frightfest 2007 which showed 21 year old Emily Poppy Barton from Stoke-on-Trent, who started with Make Some Noise on the Youth Operatunity project in 2006, perform an opera solo. Keynote speakers included: Tim Sharp, Chief Executive Officer, Make Some Noise; Eddie Evans, Chair, Make Some Noise Trustees; Julia McBride, Head of Services MERIT Medical Pupil Referral Unit (Stoke-on-Trent City); Harry Hitchen, Leader, Stoke-on-Trent City Music Services; Maria Banks, Coordinator for Up Beat; Jo Blagg, Formerly Creative Learning Manager, Stoke-on-Trent Theatres; Nigel M Taylor, Head of Staffordshire Performing Arts (Staffordshire County Council). Each speaker shared their short stories of how their partnership with Make Some Noise has changed the lives of children and young people locally.